What happens when your organization is not ready for agile but you know this methodology will help? What types of behaviors or activities could you introduce to start your enterprise along the path to agility, without explicitly saying so? 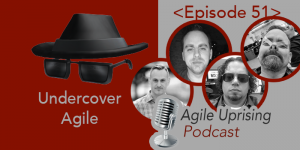 Join our hosts Andrew Leff, James Gifford, Troy Lightfoot, and Jay Hrcsko as they discuss answers to these questions and many more as part of “undercover agile!